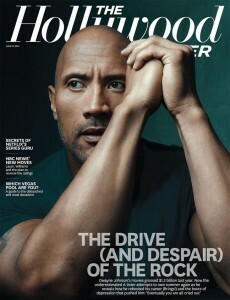 The Drive (and Despair) of The Rock: Dwayne Johnson on His Depression, Decision to Fire Agents and Paul Walker's Death | Radical Studios, Inc.Radical Studios, Inc.
It’s mid-June in Australia, and I’m working out in a Gold Coast gym with the artist formerly known as The Rock. Well, working out is something of an exaggeration for this exercise in masochism, as Dwayne Johnson guides me through three different triceps maneuvers, then tackles the biceps, making each merciless hammer curl look as easy as lifting a chicken wing. I watch his biceps bulge like a balloon. The man isn’t just huge, he’s gargantuan — a 6-foot-5, 252-pound mountain of muscle, his arms hardened and honed, his chest as big as a bull’s. His upper body is covered with tattoos: a flower on his shoulder blossoms into a full-blown male figure on his chest, with a healthy smattering of shark’s teeth thrown in for protection. “The warrior is over my heart, which is the overall sentiment,” he says. In case you didn’t guess. This is Hollywood’s reigning action hero, an ambitious wrestler turned actor, as smart as he is supple, as driven as he is dynamic. Combining several traits of the ’90s action stars — the wit of Willis, the strength of Schwarzenegger, the heart of Stallone — he’s become the go-to guy for studios anxious to reboot their franchises. Twelve years after Johnson’s inauspicious big-screen debut in 2001′s The Mummy Returns — and after a decade of “singles and doubles,” as he puts it — he is poised to go from a dependable player to MVP, if two mammoth upcoming releases deliver. First is MGM/Paramount’s sword-and-sandals epic Hercules, due out July 25. Then there’s the 2015 Warner Bros. earthquake disaster flick San Andreas, which Johnson is shooting here in Australia at a salary of about $12 million — the type of number that makes even other A-listers blink. Since then, his star has soared. He helped propel G.I. Joe: Retaliation to a worldwide box-office take of $376 million ($74 million more than its predecessor) and boosted Journey 2: The Mysterious Island to a worldwide gross of $335 million (nearly $100 million more than Journey to the Center of the Earth). More impressive, after he joined the Fast & Furious ensemble in 2011, its earnings doubled, with Fast Five making $626 million compared with its predecessor’s $363 million. Fast & Furious 6 went on to generate a whopping $789 million, and Fast & Furious 7 is set to open in April. Johnson has the ease and confidence to go with it. He projects a comfort level with success that makes you think things always have been this way and always will be. Which makes it all the more surprising to learn this is the same guy who endured massive upheaval as a child; got into frequent trouble with the law as a teenager; was kicked out of his home at 14; and faced the end of everything he had dreamed about when he was dumped as a professional football player, sending him into a crippling tailspin of despair. Sitting in the cavernous living room of his rented house a few hours after our workout, wearing a hoodie that has his hero Muhammad Ali’s name scrawled across it, Johnson shows no trace of his turbulent past. He also speaks openly of his live-in girlfriend, writer-musician Lauren Hashian, 29 (“She embraced and loved me at my very worst and lifted me up to be my very best”), and of his ex-wife and longtime manager, Dany Garcia, 45 (whom he met as a student and divorced in 2008). The mother of his 12-year-old daughter, Simone, Garcia oversees every aspect of his business empire, and her family has become his — her brother, Hiram, is Johnson’s producing partner; her husband, Dave Rienzi, is his conditioning coach. He describes his current life with a sophistication not always apparent onscreen, laughing readily and infectiously. But his past is never too far from his mind. “I remember it as if it were yesterday,” he says. Johnson was devastated. He almost chokes up describing that time and his sense of hopelessness. Just a week earlier, he’d witnessed his mother in tears when her car was repossessed; he had added to her burden by getting into fights and joining a theft ring that preyed on the most affluent stores in Waikiki, which often landed him in the hands of the police. He was angry at his father for being absent and for forcing him to move some 13 times during his childhood, staying in some places for just a few months at a time. Once, in Nashville, after he had sprouted to his full height, his fellow students were convinced he was an undercover cop and refused to talk to him. “It was like I had an APB out on me,” he says. As his mother scrambled for the work that would land them a new home, he resolved never to go through this again. And that’s what he did — pounded his muscles with weights, pushing himself until he went from being a gangly, pimpled youth to a leviathan who could legitimately envision a career in the NFL. At 18, he won a full football scholarship to the University of Miami and was ecstatic when he was the only freshman chosen to play, a rarity in college football. He was in love with the game and even dabbled in steroids, thinking that might help, though only for a while, as he didn’t see the desired effect. “I tried them when I was 18, me and my football buddies. Nothing happened,” he says. He dropped out of school without even taking his midterms and went to stay with his parents in Tampa. For weeks, he remained there, his shoulder in a sling, lethargic and unable to break out of his despair, until his coach called. He did what he was told and restored his standing at the school, still clinging to the dream of playing in the NFL. But more injuries affected his game, and when the draft came, he wasn’t picked. In 1995, he was signed by the Canadian Football League’s Calgary Stampeders at a yearly salary of $35,000, nothing like the six figures he had imagined that would have allowed him to make down payments on a home for his mom. Then things got worse: Within months, he was relegated to the practice team, which paid a mere $250 a week. Abandoning football, he followed his father and grandfather into wrestling, taking the moniker “Rocky Maivia” from his dad’s first name and his granddad’s last. His father reluctantly agreed to train him, afraid Dwayne was embarking on the same hardscrabble life that had cost him so much pain. The Rock made millions for himself and the WWE, working closely with its chairman, Vince McMahon, to whom he still turns for counsel. He became one of the few modern wrestlers to cross over into mainstream pop culture because, he says, he dared to add a dash of comedy to his bad-guy turn. WWE capitalized on that with massive merchandising (Garcia says together they still are creating six or seven new products a month) and even animated shows like Slam City that feature The Rock as a character. Five years after Johnson started wrestling, a 2000 hosting stint on Saturday Night Live led to The Mummy Returns, which was followed by more than a dozen films including 2005′s Be Cool, 2007′s The Game Plan and 2008′s Get Smart. Still, the star knew something was missing. First they changed publicists. But it was only after a long telephone conversation with Garcia and business manager Howard Altman in 2011 that Johnson realized he had to go further. The real turnaround came after CAA put together Johnson’s Fast Five deal, when he debated returning to the ring for the first time in years, a move his representatives at CAA strongly cautioned against. (He would do so in April 2011 for WrestleMania XXVII.) That was when he bolted. On McMahon’s advice, Johnson spoke to WME’s Ari Emanuel, who flew to Johnson’s Florida home the next day and invited him and Garcia to a meeting in L.A. with about 150 WME staff, including the man who would become Johnson’s key rep, Brad Slater. Johnson was stunned by their enthusiasm and hunger, a hunger he shared. Hercules is part of that swing. Johnson had contemplated telling the Greek demigod’s story ever since seeing the 1958 version of his story with Steve Reeves. He was developing his own film on the subject when he got a call about starring in an MGM movie. Soon, he signed on with Brett Ratner as director, and the pair prepared for a grueling four-month shoot in Budapest, Hungary. The challenge wasn’t easy; unlike his supporting role in the Fast & Furiousfilms, this would mean being in peak physical condition, day in and day out — showmanship level, beyond even his tip-top shape for Pain & Gain. Johnson had suffered a bad injury in his 2013 return to the ring, when he fell and tore both his rectus tendon and adductor muscle while fighting former nemesis John Cena. After seeing a doctor, he opted against surgery. Two days later, by sheer coincidence, something else went wrong. That was two weeks before the start of production, and this time Johnson had no choice but to say yes, though the shoot now had to be delayed a month at a cost of $2 million. He was lucky: Other than the delay in shooting, production went well. But soon after his return to Florida, he got devastating news: HisFast & Furious friend Paul Walker had died in a car crash. When not filming, Johnson gets up at 4 a.m., does around 30 minutes of cardio, then grabs breakfast (his first of six daily meals) before hitting the weights. Working from his base in Fort Lauderdale, he oversees a fledgling production company, the appropriately named 7 Bucks Entertainment, with a five-man staff there and other employees in Los Angeles and London, pushing into film and TV. He has a new HBO series, Ballers, a sports-related Entourage in which he will appear as a sports agent, that starts shooting in the fall; and Wake Up Call, a reworked version of his canceled TNT reality-competition series The Hero, where he will help people turn their lives around. He has not ruled out a return to the ring, though he says its scale — both as an event and a payday — would have to equal or exceed his 2013 fight, and he continues to work with WWE, though film is his real focus. Now Johnson is turning to the foreign markets he knows are pivotal to a contemporary star’s success. Rebecca Sun contributed to this report.